Trimming your lawn means cutting the grass that your lawn mower couldn’t access. Most lawn mowers do a poor job of cutting grass along the edges of the lawn. The grass just grows too sideways in that area for the blades to get at it, or you can’t get the wheels into planting beds nearby. You need to do some edging or trimming along the perimeter of the lawn. You may need to put in a mowing strip around the outside of the lawn that greatly simplifies edging. Edging and trimming are pretty close to the same things. 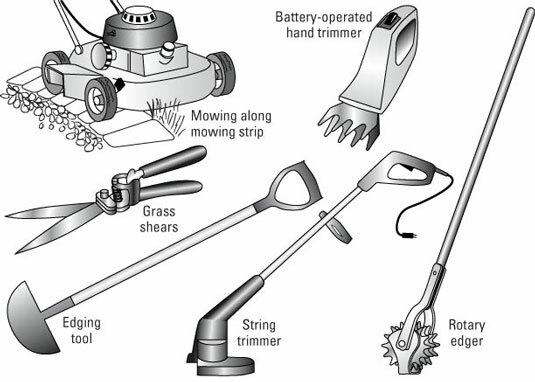 Some tools are called edgers because they are designed to trim the lawn along a hard surface like a driveway or sidewalk. Edgers cut a nice clean edge, but leave some dirt and grass debris that you need to clean up. Trimmers, on the other hand, can be used anywhere — along a hard surface, in tight spaces, next to planting beds, and so on. Trimmers also leave some clippings on paths and driveways that you need to sweep up. In any case, edging and trimming are the finishing touches of mowing. They accentuate the lines of the lawn and planting beds and gives the whole picture a well-manicured look. Trimming and edging are kind of like getting a shave after you’ve had a haircut. That final touch makes everything look better. Edgers and trimmers come in a number of different types, from simple handheld clippers to gas or electric models. The classic push-pull, handheld rotary edger does a clean job along walks and driveways. Simply place the wheel on the hard surface with the blade just over the edge, and push and pull. Power models, with rotating blades, make the job easier, especially if you have a large area to cover. Take care, though — power models can be dangerous, so follow all the safety precautions. You can also use gas or electric weed whips, which cut with rotating nylon filament. String trimmers: These trimmers use a section of plastic or plastic chain instead of a string filament, and some even use metal rather than plastic. Generally, these machines cut off the top portion of long grass or slice off weeds close to ground level. Choose a trimmer with an automatic or semiautomatic feed system for the nylon whip. Some trimmers force you to stop the engine and lengthen the whip by hand every time the whip wears down. Electric trimmers: Electric trimmers with power cords are the least expensive trimmers. Although these trimmers are lightweight and quiet, the cord length allows you to work just 50 to 100 feet from an outlet. Battery-powered models allow you to roam more freely, but most limit you to about 45 minutes of continuous trimming. Gasoline-powered trimmers: Trimmers with gas power offer similar features as the electric models — but on steroids. Gas-powered trimmers give you more power, need more maintenance, make more noise, and let you do more work in less time.